Who doesn't like flowcharts? Nobody, that's who! 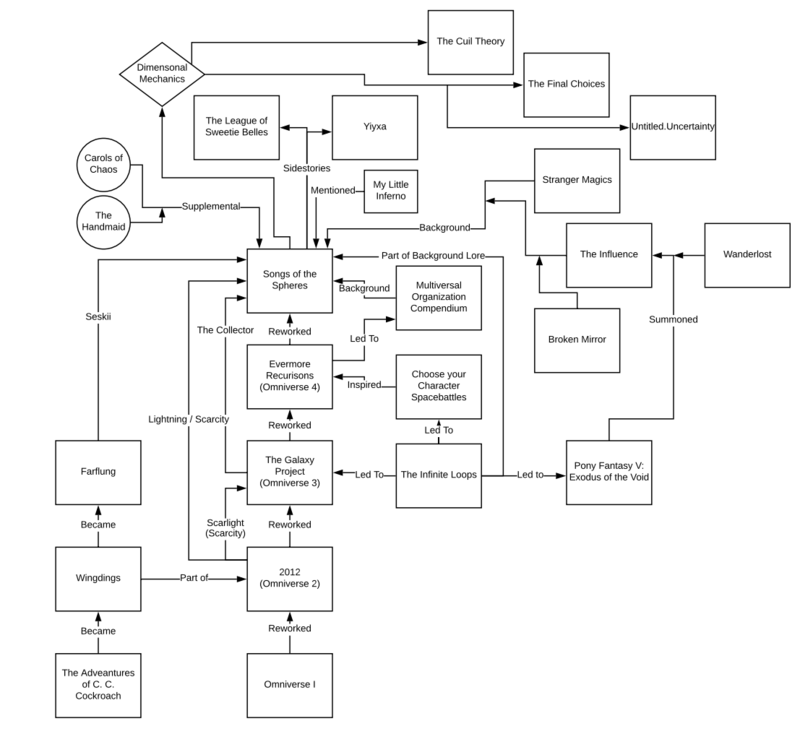 I just made a flowchart of everything* I've written and how they're connected. Credit goes to TheMajorTechie for the idea. To the surprise of absolutely no one, it's all centered on Songs of the Spheres. Report GMBlackjack · 133 views	· #songs of the spheres #flowchart #charts #bored. This is the FINAL CALL for Sombra's Clipshow! IT IS OFFICIALLY TIME TO PANIC. All of you fans, writers, and otherwise have TWENTY-FOUR HOURS (edit: deadline already passed, sorry) to make your submissions! Submissions for what you ask? This. Work quickly if you've never heard of it before, cause you've only got one day! You know what we need now that Christmas is over? Specifically, hats that are tangentially related to time. And being in time. And other temporal things. I totally didn't just get A Hat in Time for Christmas, what are you talking about. -GM, master of Dweller's Mask. On this day, precisely one year ago, Songs of the Spheres was published on fimficiton. There wasn't much hubbub. The people who read it were generally the people who were part of its creation in some way or other. But slowly, we grew, larger and larger... And today, Songs of the Spheres can be said to be a success. And we aren't even half done! Report GMBlackjack · 140 views	· #celebration #anniversary #songs of the spheres #one year #fun time #FIFTH DAY #questions.